I hand paint each one. The incense stick drops its hot ashes into the bottle, making it safer and less messy to burn. The bottles are portable so you can move them to any room in the house. They can be made in colors to match your decor, themed with your favorite character, team, driver, band etc. To use, simply wedge the non-incense end of the stick into the provided key ring. I attach these to each bottle with decorative beaded hemp. Now the smoldering stick will be suspended, tip down, from the key ring at the top of the bottle. The hole I drill at the base of each one allows the air to flow, keeping the incense lit. The smoke will escape the bottle into the air while the ash will stay neatly inside the bottle. 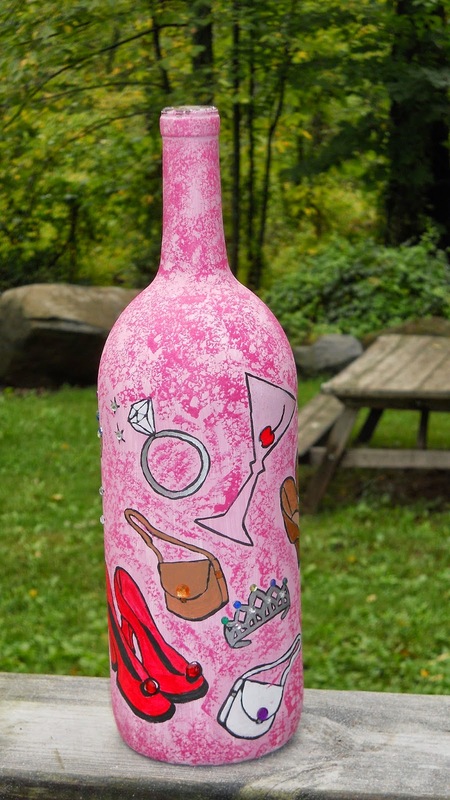 This particular bottle was an order for a "girly-girl" who loves to shop. Happy to report that she loved it!